How to estimate the thread usage. There is no getting away from the fact that trying to estimate how much thread you need for a design is near impossible based on maths alone. The only reliable guide to how much thread of each colour will be needed in a chart, is to stitch it. And even then, different stitching styles, tensions, and wastage due to pulling out and rework, all contribute to the end result. Some stitchers source 18 inch pre-packaged threads while others buy bulk spools or 8m Skeins. Embroidery floss usually comes in 6-stranded packaging, either in skeins, on spools, or ready cut. And you may mix and match within a design for effect. So if you stitch a simple line of backstitch , one inch in length , without any of it going behind the cloth, you could start by assuming thats ‘one inch’ of floss. But if you use 2 ply, there are actually two inches of floss used. 108 inches of single ply floss. Some people describe the amount of thread in inches, some in bundles, and some in skeins: any estimate always needs to be aware of the number of strands in use too. The size of the stitches affects the ‘amount per stitch’, and the larger the stitch, the less is lost turning into a new direction, or around the back of the cloth. noting how many stitches-to-the-inch you are working. That will generate 100 stitches. Look at the simple length of floss used. If that was 36 inches, then each stitch took 36/100 inches = 0.36 inches of floss on average, assuming ideal stitching and no waste. This is our ‘inches per stitch’ value, and we can start by multiplying that by the number of stitches of that colour in any chart. What about varying the ply? If we are using a mixture of 1,2, or 3 ply then it may make sense to multiply the amount by the number of strands and express the length in terms of a single strand. Our software allows you to adjust the estimation factor used for calculating the length needed. We ask for the length per stitch, and this varies based on the stitches per inch. At 14 stitches per inch, the value (as above) might be 0.36 per stitch per ply. At 6 stitches per inch, the value might be 0.36 x 14 / 6 = 0.84 per stitch per ply. But the further we move away from 14 stitches per inch, the less accurate that becomes, and so its a good idea to perform the 100 stitches using the stitch size you will actually be working with. If you prefer to work using ‘always 2 ply’ then your estimated length will have been 1250 inches of 2 ply. From the 2015 editions onwards, we offer more options for you to set the estimates more accurately. 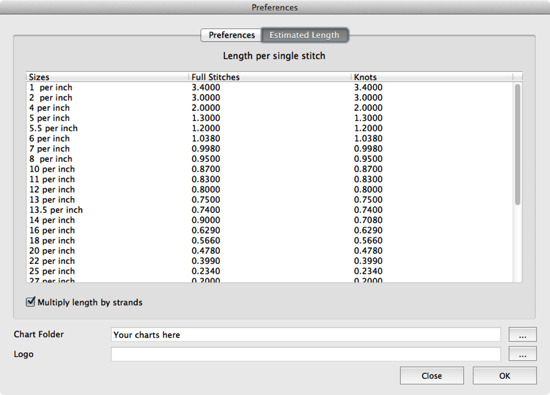 In the preferences dialog, you can now set the values independently for your choice of stitches-per-inch. And if you want the thread estimate to go up by every strand you use, (e.g. 2 strands reports 10 inches, 3 strands reports 15 inches for the same number of stitches), then tick the ‘Multiply length by strands’ option. Classic Cross Stitch (http://www.classiccrossstitch.com/threads.html) has a useful page of advice on this too. An estimate as to how many stitches can be obtained from an 8 m skein of 6 ply floss for various stitches per inch on canvas, based on figures obtained for different stitch counts. 8m gives 24m of 2 ply. ..before we make allowances for wastage.